You know those days when your worst nightmare has come true? 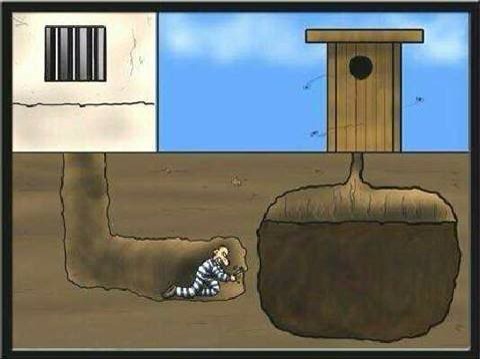 When you think you are moving toward freedom, but actually you are just headed for the crap house? When everything seems to be going from bad to worse? For a few years now, I have had this nightmare that the (original) septic system behind our thirty-five ‘ish year old house would die, needing to be replaced, before we had the chance to move on … on to greener pastures. You see, replacing a septic field is off the charts expensive. Imagine the cost of a brand new kitchen, with granite counter tops, new flooring, back splash and lightening … now imagine spending that same amount of money on something that deals with human excrement. Though one could not (easily) sell a house with a septic field that needs replacement, the cost of making that replacement does not increase one’s home value AT ALL! This spring was going to be the time to hire that (freakishly expensive) realtor, post the sign, and try to live in a house that is clean beyond that which is normal or natural. Then hubby had a conversation with an expert in the field (gotta love humorous puns when life is … crappy), who said that the septic field needs to be replaced. Though we are now seeking a second opinion, my heart is in my throat, my shoulders are sagging, and my head trying to process the how of this problem … how do we pay for this? It’s a good thing that wondering is one of my favorite things. (Goodness and light will return, just needed to let my volcano erupt, so that I could see my way through the mire).